Glenn Strange gets a fresh coat of paint as he is being transformed into the Frankenstein Monster by makeup genius Jack Pierce. On this day, May 5th, in 1889, Jack Pierce was born. A Greek immigrant in America, he was a baseball player, a silent movie actor and stuntman, and eventually, a makeup artist. Becoming Head of Universal’s Makeup Department at a time of unparalleled effervescence, Pierce created the wolfmen, the living mummies and all the memorable movie monsters — including a certain Bride — we have come to regard as the classics. The crowning achievement, of course, was his brilliant design for the monster of Frankenstein. In the early days before modern movie cosmetics and lightweight foam appliances, Pierce painstakingly built up his remarkable creations with wax, cotton, greasepaints and crude chemicals. In 1935, he designed an early reusable “appliance”, casting The Monster’s towering forehead in rubber. Despite his years of service and his incalculable contributions, Pierce was summarily let go in a management shuffle at Universal in 1947. He continued working as a freelancer for movies and TV. A legend today, he died in relative obscurity, in 1968. 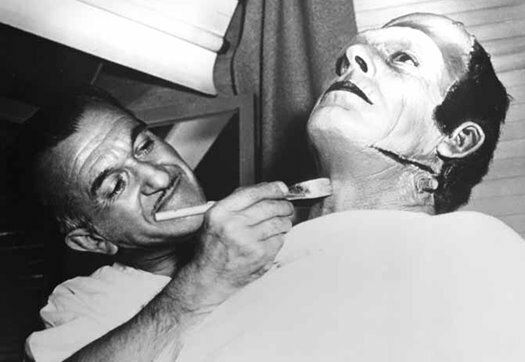 See my previous post about Jack Pierce creating the Frankenstein Monster, and a post about the "lost" Karloff Frankenstein. Jack Pierce on Wikipedia, featuring links to interesting sites. can you imagine how much praise he would've gotten if he had lived a few decades more? i know he would been REALLY old, but jeez, there woulda been an honorary Oscar, con appearances with audiences lined up for miles--he would be treated like a god by rick baker and all the guys that followed him. i didn't realize he and Karloff died the same year! Almost: Pierce died in July '68, Karloff in February '69. I remember the day Karloff died. I bet all boom-age Monster Kids do.